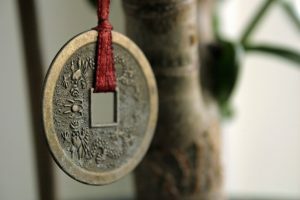 Called a “Feng Shui Money Cure”, Chinese coins are used to not only draw wealth into your life but also for protection and to create good luck. There are many ways to use chinese money coins to attract wealth to you! 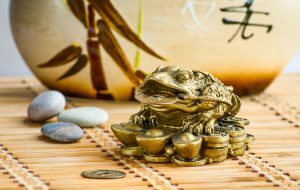 Not only can you use the individual coins, in sets of three, but there are beautifully carved statues incorporating Chinese coins with wealth drawing money toads, money turtles and money dragons. At Kheops, Intl. you can find all your Chinese money cures easily. Tie your money coins together with red ribbon or cord. There are informative you tube videos which show you the way. You will tie three coins together in a line or a triangular knot while visualizing your personal business success, bills being paid, credit debt being paid, and money coming to you. When you tie them together, make sure the faces of the coins (not the back) are facing up and that they are facing up wherever you place them. Inside your mailboxYou may come up with other creative places for your money coins. Make sure to place them in a clean area you will access daily. Always place them loose or tied together in sets of three, six, nine, etc… Keep this area clean. Making a daily ritual of cleaning the area and visualizing success and luck are an excellent meditation! You can double the affect with two money toads! “Zhāo cái jìn bǎo!” May you have wealth and success!